A Night of Inspiration; 2014 "It's My Life' Youth Film Festival! The 2014 “It’s My Life” film festival was a huge success and a truly inspiring night with young film makers around Atlanta. One unique aspect of the “It’s My Life” film festival is that it’s open to all youth under 23, whether you’re in college, high school, middle, or elementary school. Our youngest film maker was just seven years old this year! This year we had twelve entries that were selected to be a part of the festival. 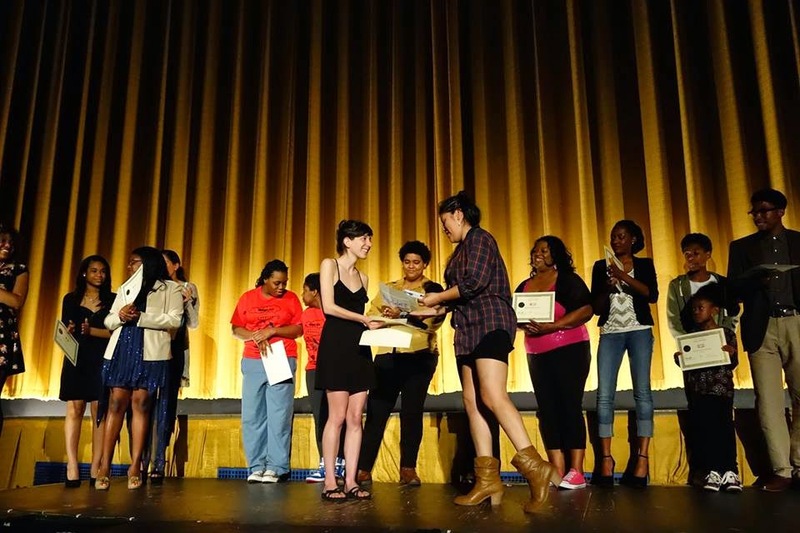 Every film maker was given a certificate for being selected and we’re super grateful that WonderRoot Community Art Center awarded every film maker with a free year membership! Young film makers now have access to all sorts of really amazing resources and classes! Big props to WonderRoot for providing this really important resource year after year! All of our AMAZING volunteers, you all made this happen!! …and a big thanks to the Plaza Theater! Be sure to join the new "It's My Life" facebook page to keep in touch! When we and future generations look back in history, we will see a Governor who failed to understand this. That is why he restricted affordable healthcare and expanded gun rights, publicly celebrating the most dangerous and irresponsible gun bill to be passed in the country. We will see a Governor who allowed and supported attacks on the rights of women by further limited access to reproductive choice. A governor, who condoned removing unemployment benefits to the same bus drivers that protected our children during an unnecessary snow crisis. We will see a Governor that supported drug testing of food stamp recipients and continues to place road blocks against the Affordable Care Act. You have continually shown your support for the few rich at the cost of the overwhelming poor and working class Georgians by capping income taxes, and restricting loans and scholarships for our states students. party agendas than the welfare and progress of the people he represents. Although this is of deep concern to us, we are hopeful that moral responsibility will be reflected in the future legislation of Georgia, and we are willing to organize toward that end. In the words of Dr. Martin Luther King, " We must accept finite disappointment, but never lose infinite hope." Brunetta Nelson and her family have worked to make D’BABS Construction a staple in Atlanta’s construction industry for the past 26 years. When their point of contact at SunTrust left abruptly Brunetta and her family struggled to find a new place to make payments. When her realtor called to tell her about the foreclosure Brunetta was completely caught off guard. SunTrust stole their tenants and now they’re trying to steal the land right out from under the sisters of D’BABS. 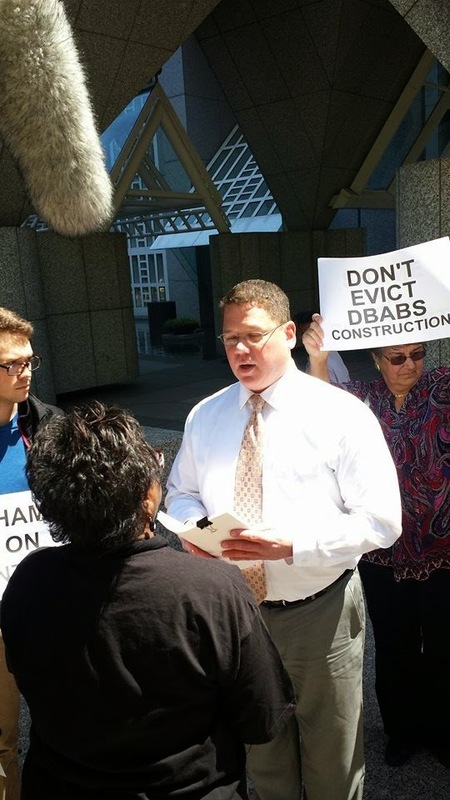 This small, black women-owned Construction Company is facing immediate eviction at the hands SunTrust Bank. “It is so painful for my sisters and I to walk into our office and see that everyone has been run away and how much we have suffered over this mishandling of a small family business that was built brick-by-brick for 25 long years. I can’t count the toll of the sleepless nights of crying, the loss of my hair, and the choices made as a result of this disaster”, stated Brunetta. SunTrust representatives claimed they would look into the matter but today in court it was made clear that they intend to evict in the next seven days. 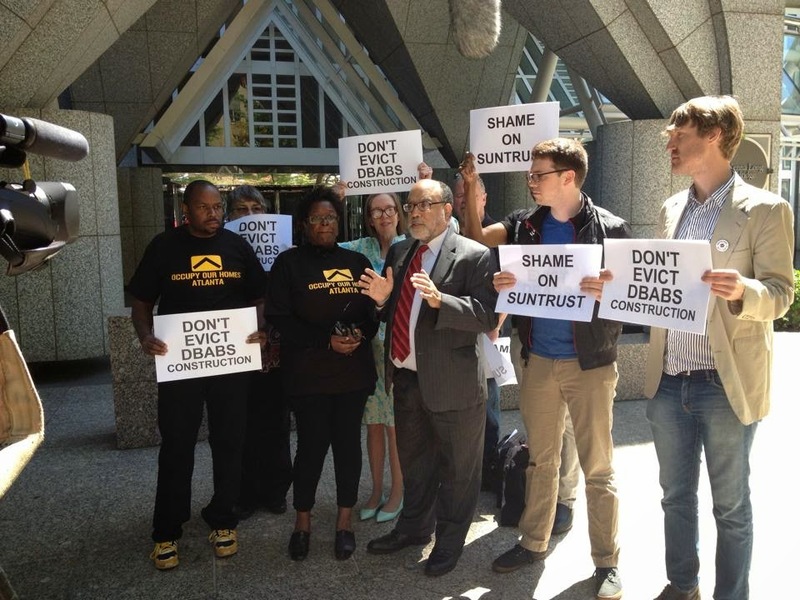 A community coalition plans to return to SunTrust with greater number next week if the bank doesn’t make right on their commitment to work with D’BABS. Sign the petition to save D’BABS here. "It's My Life" Film Festival Hit's Atlanta 4/29! 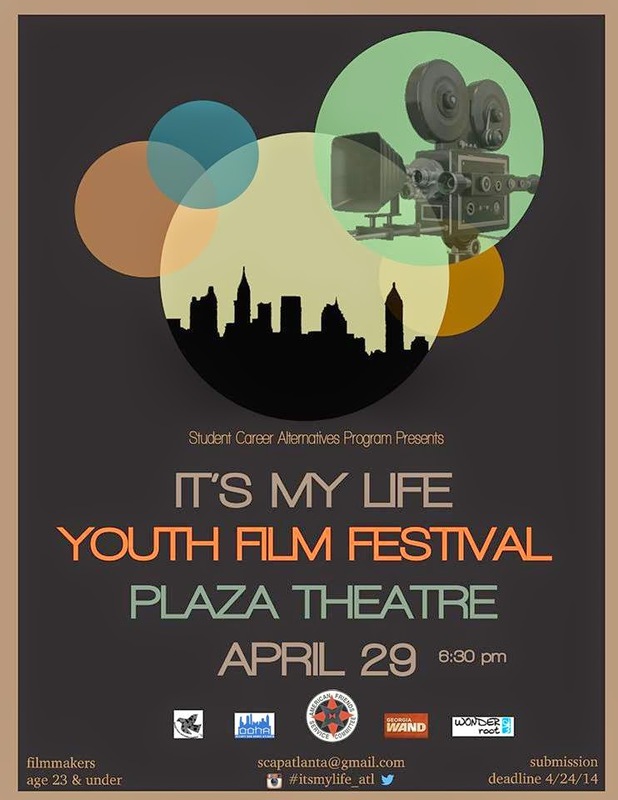 Join us at our 4th annual screening of the "It's MyLife" Youth Film Festival! 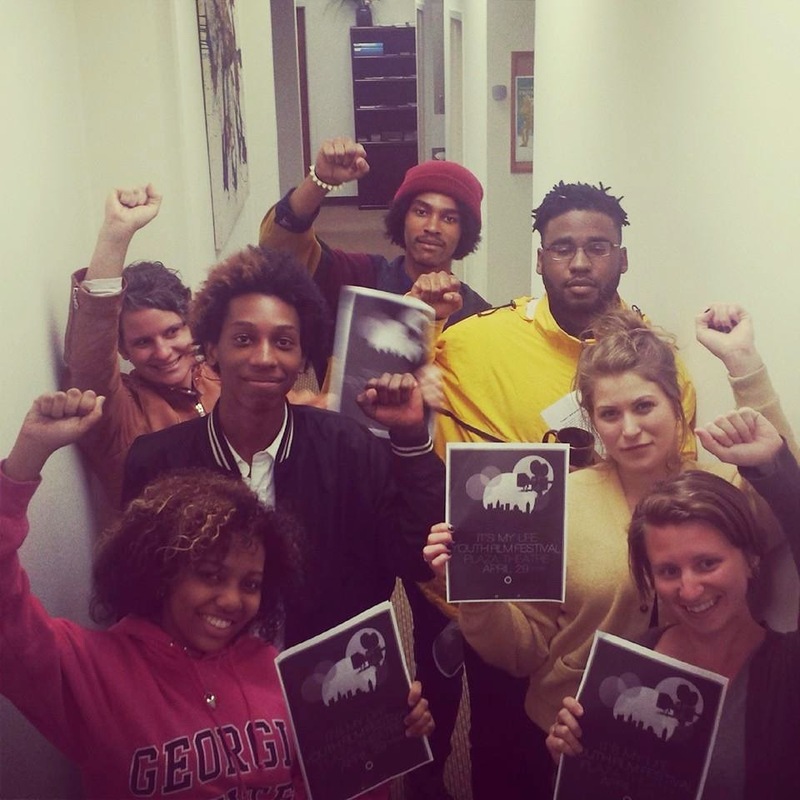 "It's My Life" challenges youth filmmakers age 23 and under from around metro Atlanta to think about tough social justice questions and express their solutions creatively through 3 minute films. Every submission is shown on the big screen at the Plaza Theatre, and winners will be announced in person at the event. This free event is a great networking opportunity for young filmmakers, family, friends, teachers, youth workers, and the community. Let's celebrate local youth using their talents to think about how to make change for peace and justice! The dealine to enter is 4/24 at midnight, still time! Youcan also see info for the 2014 contest, including the guidelines and themequestions here. Like our page and learn more about the festival here. Follow us on Twitter and Instagram @itsmylife_atl for news and updates! Moral Monday GA Marches on the Money! 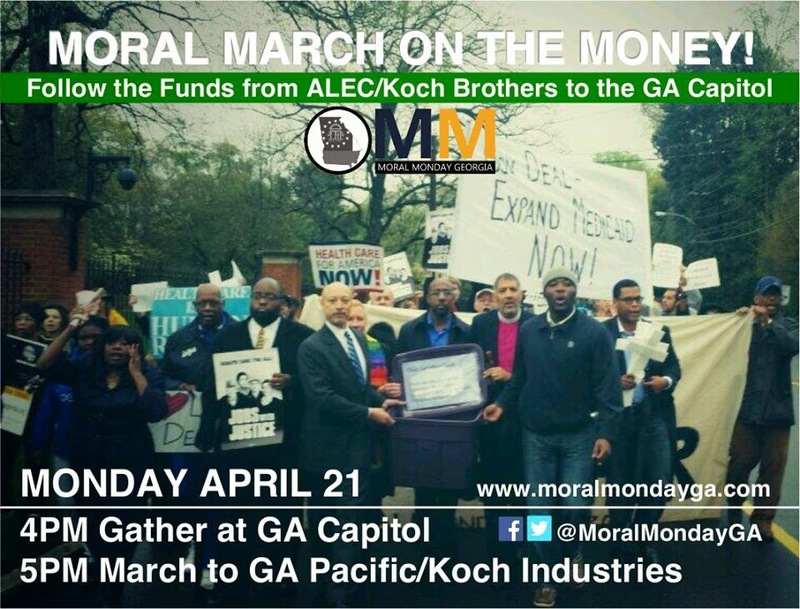 Moral Monday GA's 1st march will follow the funds to the Georgia State Capitol that originate from Georgia Pacific where the Koch Brothers operate to finance ALEC backed right-wing attacks that benefit billion dollar industry men at the expense of everyday Georgians. We will demand that all Georgia politicians withdraw their membership and support from ALEC and other Koch Brothers political initiatives that push everyday Georgian citizens out of the political system. We call on them to express their independence from these outside interests and instead represent the people of Georgia as they are required to do. Civil rights icon John Lewis has expressed his deep support for Moral Monday GA and is joining us for this march as is Reverend Warnock of the Historic Ebenezer Baptist Church. Rev Warnock stated, "The majority of Georgians want Medicaid expansion. The well connected billionaire Koch brothers do not. If they win, we have an oligarchy and not a democracy. So we seek not only to expand Medicaid but to expand the circle of who has influence and who has a voice. Healthcare for all, one person, one vote. That's our fight and the people's agenda." Dozens of bills attacking everyday Georgians were passed by the GA State Legislature this year and in years past. We know that there is a concerted well-funded effort developed by the American Legislative Exchange Council (ALEC) & Koch Industries that provides the resources to develop these attacks and works to influence politicians like Governor Deal and others in all levels of government to make sure their right-wing agenda is fulfilled. Georgia is a breeding ground for these outside monied interest attacks on everyday working people. Nowhere is this more obvious then the refusal to accept Medicaid expansion. Governor Deal has a choice to make; stand with the people of Georgia who want and need Medicaid expansion, or stand with the Koch and ALEC types. Moral Monday will continue to pressure the Governor to do the right thing and we will continue to expose the forces that stand in the doorway of 650k hardworking Georgians that deserve health care. Georgians like Nancy Daniell who stated, " I'm too young for Medicare, I don't qualify for Medicaid since Governor Deal has chosen not to opt in for Medicaid Expansion. Since I live at below national poverty levels of income & have no health insurance, I chose to try to enroll in the Affordable Care Act's health plans;However, since the ACA's plans do not count social security income as a tax exempt status, the most "affordable" health care plan they could offer me would cost approx. 40% of my monthly gross income." Nancy will be one of several speakers negatively affected by the extreme attack on everyday Georgians. Jackie Rodriguez, who also falls into the Medicaid gap stated, "Governor Deal and other Georgia politicians would rather take special interest money to pass harmful legislation than take federal money to help 650k fellow Georgians like me." 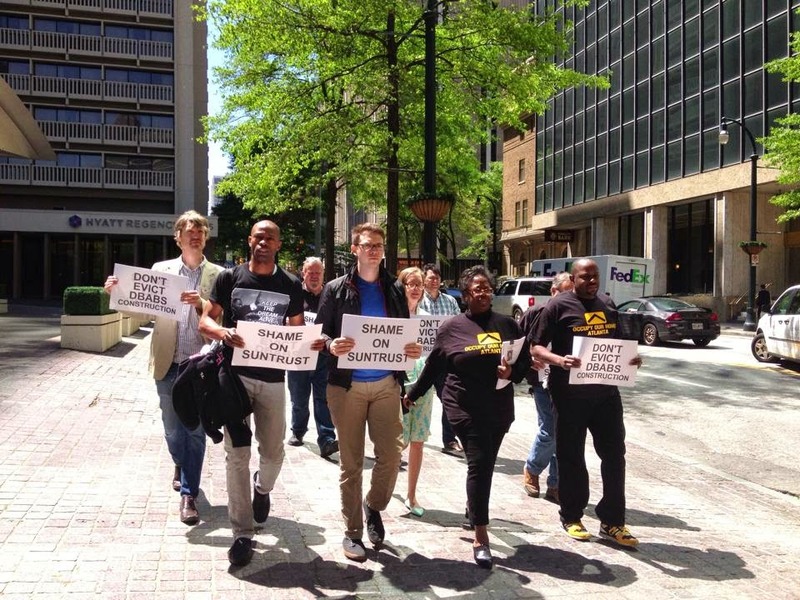 American Friends Service Committee is a convener of the Moral Monday Georgia movement and is excited to be a part of such a broad historic coalition with over 50 organizations and dozens of church congregations. The collaboration between Metro Atlanta Democratic Socialists of America and Occupy Our Homes Atlanta (OOHA), and American Friends Service Committee which led to last year's popular bus tour of OOHA's activities in the Pittsburgh neighborhood and the proposed Falcon's stadium, continued this year with an April 5 tour of OOHA and local residents' recent work in four core Atlanta neighborhoods: Pittsburgh, Vine City, English Ave, and Peoplestown. The tour began at the Rick McDevitt Center in the Peoplestown community where OOHA and AFSC plan to launch a community wide housing justice campaign later this year. Residents and OOHA members introduce the tour. 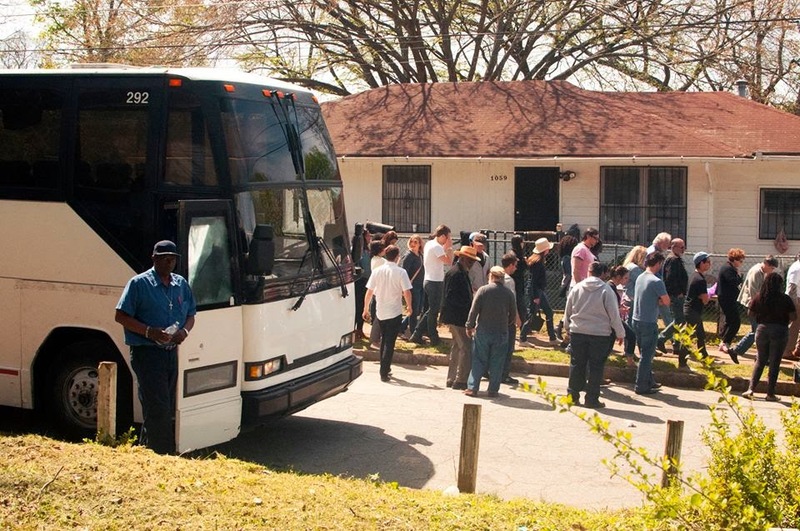 Then, the bus carried participants through the neighborhoods to stops that focused on individual housing fights that brought major victories or inspired other landmark housing fights across the country. At each stop resident fighter who led each campaign talked about why they fought, struggles of the campaign, and what work they’ve been inspired to continue since. The tour showcased the diversity of various housing justice campaigns that OOHA has been able to win with their organizing models. From renter fights, to foreclosure resistance, even reclaiming vacant homes for homeless people it's clear that OOHA is nimble enough to look at the issue of housing from dramatically different angles. The tour will ended with an informal dinner at Emmaus House, a community center in Peoplestown that has provided social services and has been a catalyst for community activism since the urban renewal days of the 1960s. Steve Boudreaux, Home Defender Gone but not Forgotten! On Monday April 7th, long time home defender and OOHA stalwart Steve Boudreaux passed away after suffering a hemorrhagic stroke a week prior. 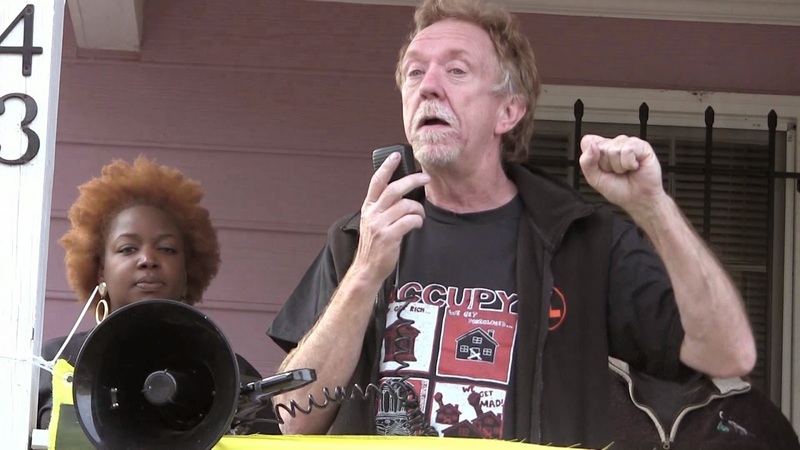 Steve got involved with Occupy Our Homes Atlanta as his home was headed toward the auction block on the Cobb County courthouse steps. 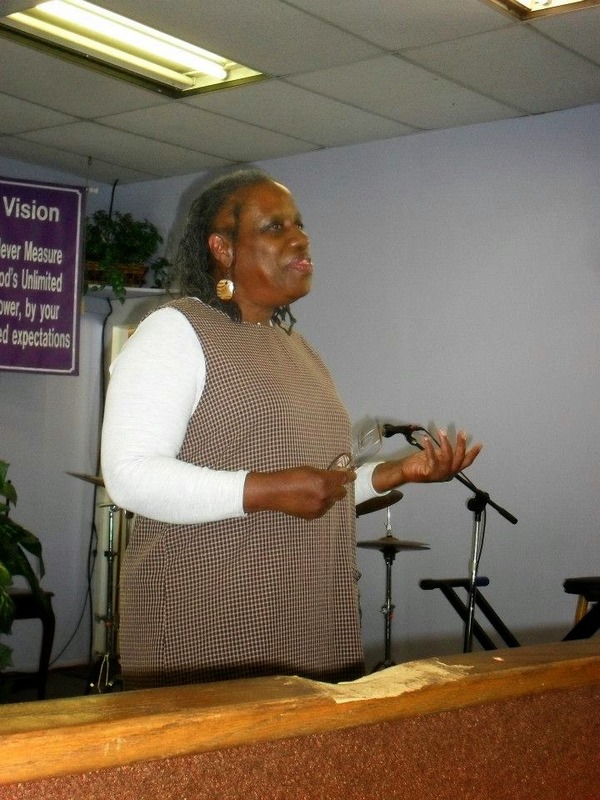 After Steve reached out to OOHA he learned how to launch a housing justice campaign. 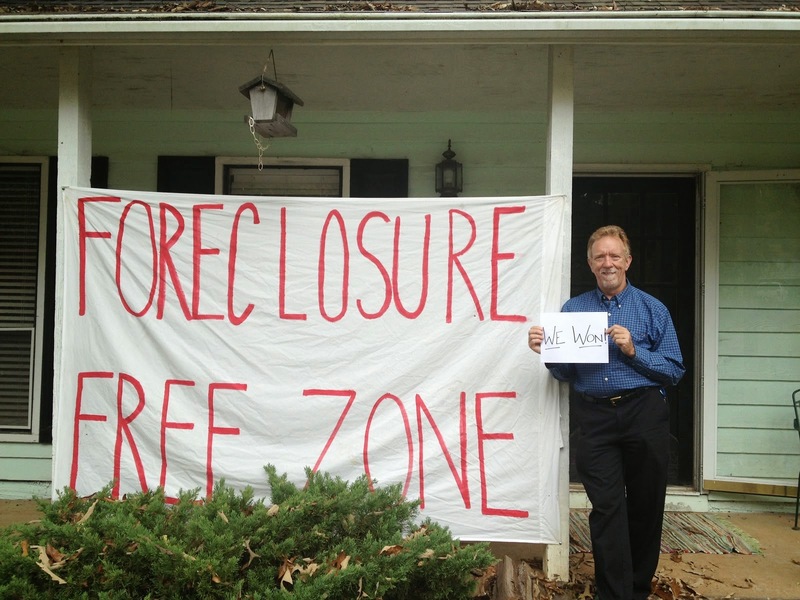 Steve eventually won his campaign and forced Wells Fargo to rescend his foreclosure and make a deal he could afford. After Steve won he made one thing clear over and over agian, he wanted to pay it forward. 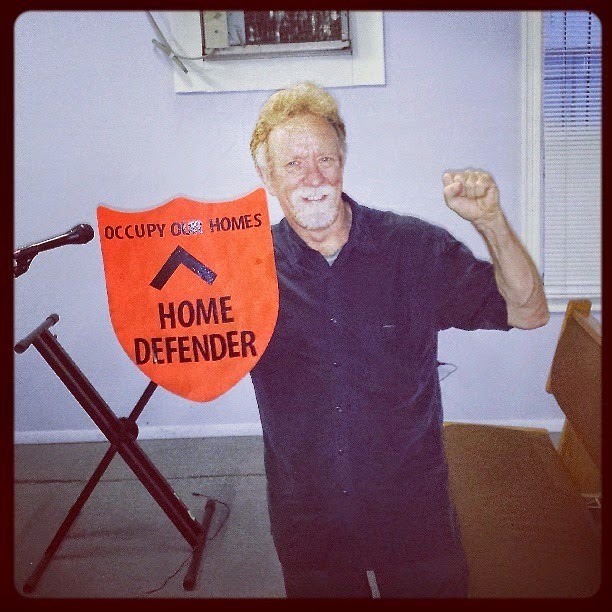 Steve went on to being one of the most active members of OOHA, showing up to meetings, comforting folks coming in the room with their own housing struggles, being a walking testiment that when we fight we win, and coming to just about every action we plan. Steve stuck around through the good times and the bad. We all came to love him, and he will be deeply missed. As we mourn the loss of a dedicated activist with a huge heart, we have been invited to attend Steve's memorial service. The service will take place this Saturday (4/12) at 2PM at Emerson Unitarian Universalist Congregation located at 2799 Holly Springs Road Marietta, GA 30062. During this difficult time we are all reminded of Steve's pay it forward mentality. Though Steve didn't mention it often, he was a veteran and the issue of veteran evictions was very close to his heart. Please take the time to sign and share OOHA's latest veteran home defenders online petition. OOHA will be holding a special memorial service 4/19 at 7pm, details TBA. No Mr. Governor, we will not go around back. While you might think it is hard to get hundreds of people to agree instantaneously, for this question the answer was swift and unanimous. We, the people, assembled in front of the Governor's Mansion, the People’s House, would not leave the front of the mansion and deliver the wishes of 50,000 people to the back door of our house. Instead, we stood, in the rain. Packing the street in front of the mansion we waited for the opportunity to deliver the message from 50,000 of our fellow Georgians. 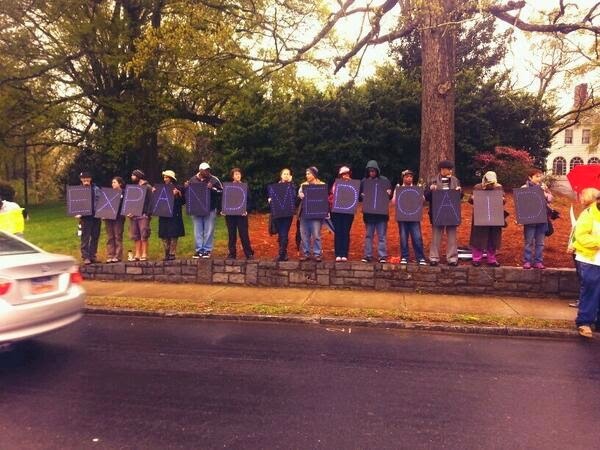 Expand Medicaid Now. Do it without delay and help stop 10 people from dying everyday. We stood for hours, hundreds of us, just waiting to have our voices heard. We were there to tell Governor Deal, that all lives matter; that is what we chanted as we lined the streets, Expand Medicaid Now; All Lives Matter, we chanted this because Governor Deal has put politics before the people he is sworn to protect. 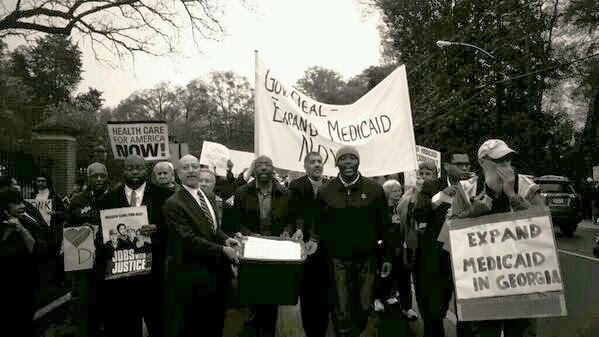 We were there to deliver our message because we believe that the 650,000 people in the Medicaid gap matter. We believe that the estimated 10 people who will die every day matter. So we lined the streets and marched up to the gate to demand to be heard. Acception our petition. Accept the voice of 50,000 people in Georgia who believe that all lives matter. In the end we were denied. We came in good faith to be received by a public servant and instead we were refused. We were turned away from the front gate and told we could deliver our petition around back. Use the back door of our house? That was not an option.So, there the gate stood. Blocking our path to the People’s House much in the same way that Governor Deal is blocking health care to 650,000 people. Refusing to acquiesce we instead decided to converge on a different door. Before we left the mansion we placed crosses in the fench, each one representing a Georgians that has already needlessly died without Medicaid expansion. The next morning we again met. Faith and community leaders, old and young, black and white, gay and straight, we met at the Governor's office at the Capitol. 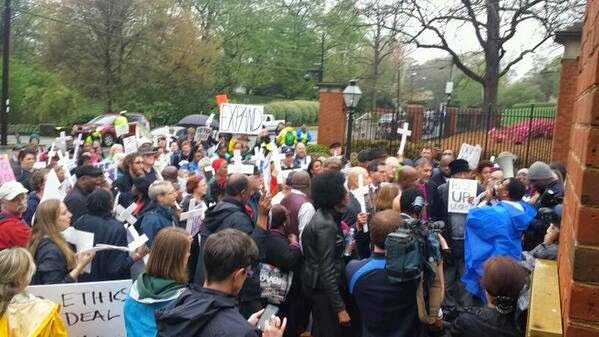 We came together in front of his office door, holding hands we prayed; that Governor Deal would open his heart and stop letting Georgian’s suffer and die needlessly at his hand. Refusing to meet us in person we were instead able to deliver the messages of 50,000 people to his office staff. We are all different types of people, from all different walks of life, but our message was the same. Expand Medicaid Now. All Lives Matter. Make your voice count. Join us at the Capital, 4pm April 21st.